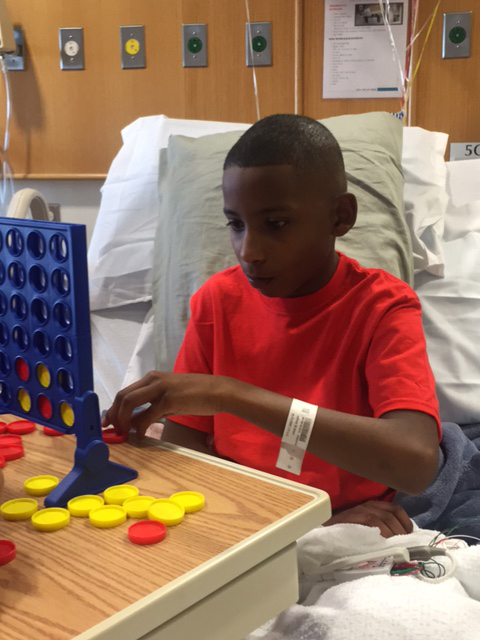 CHAPEL HILL (WTVD) -- Albert Jeffries, IV, or "Alj" as he prefers to be called, has been in and out of UNC Children's Hospital ever since he was born 13 years ago. His journey began when he was just 4 months old, and his family noticed something wasn't quite right. "He wasn't breathing correctly, he wasn't eating, he was moaning and groaning," his mom, Tina Turner recalled. The Burlington boy was rushed to the emergency room where doctors initially suspected a problem in his stomach. However, an X-ray revealed he was suffering from an enlarged heart, leading to a diagnosis of dilated cardiomyopathy. "He has a primary disorder regarding a metabolism of his heart and the biochemical function of his heart. As a result of that, his heart is not strong, it does not contract well, nor does it relax well between beats," explains his UNC Pediatric Cardiologist, Scott Buck, MD. But the initial diagnosis wasn't the scariest part for Alj's mom, it was the warning that came with it as her young son was rushed off to the pediatric ICU. "They told me his chance of survival was just zero percent, that he wasn't going to make it overnight," his mom said, shaking her head at the painful memory. But Alj did survive, although the past 13 years have been filled with plenty of ups and downs. After beating the odds early on in his life, Alj was taken off the heart-transplant list because his heart seemed to be responding well to medication. However, he took a turn for the worse two years ago. That culminated with the final episode which landed him back in the UNC Children's Hospital, where he is now. "He got really, really sick. He was short of breath, and I brought him in, and the doctor was like, 'we need to go ahead and put him in ICU, he had heart failure again,'" Turner said. And, although they've since stabilized Alj, he's not well enough to go home, and is back on the transplant list, near the very top because of the severity of his condition. It's a tough pill for any child to swallow, but Alj is very stoic talking about his condition and how he's holding up. "I just try my best to stay brave, stay strong for my mom, for my brother, and my dad," he said, jutting out his chin with determination in his adolescent eyes. The good news is that should a suitable heart come along, his prognosis is very good. "That is the great news in all of this, that the outcome after pediatric heart transplants, it's really, remarkably good. These children not only survive, they thrive," Buck said. Still, it comes at the expense of another's loss, something young Alj is all too aware of, and doesn't take lightly. "I'm just hoping that they'll give me the heart, to find the right heart, but it's gonna be really hard for me. I'm going to be really sad, because some little kid will have had to have sacrificed their life for me, and I don't want that to happen. But it's the only way I can live," he said, with a note of sadness in his voice. His mother agrees, and she added that she would never wish for another parent to lose their child, but hopes that others will consider giving the gift of organ donation. Turner and Alj are both signed up as donors. Meanwhile, the family is simply playing the waiting game, as Turner dreams of a brighter, healthier future, for Alj. "I just want him to have some normalcy. I want him to be able to ride his bike run down the street, or just run and run forever and not feel like he has to stop or get scared. I just want life for him to be renewed again," she said. As for Alj, he said the one thing he wanted for Christmas was to be able to go see the new "Star Wars" movie in theaters. Unfortunately, doctors don't think he's stable enough yet to leave the hospital. So instead he and his family are doing what they do best -- making the most out of a bad situation and leaning on the love they have for one another. "We only worry about the moment, and we live in the moment. We don't worry about what's going to happen in the future. I'm hoping only good things happen in the future, but we live day-by-day, in the moment," Turner said, perhaps offering a little advice we could all live by. According to Dr. Buck there are more than 75,000 Americans on waiting lists for various organs. There are more than 300 children waiting for a heart transplant in the U.S., but sadly about 50 die each year (in the U.S. alone) while waiting for a suitable heart donor.